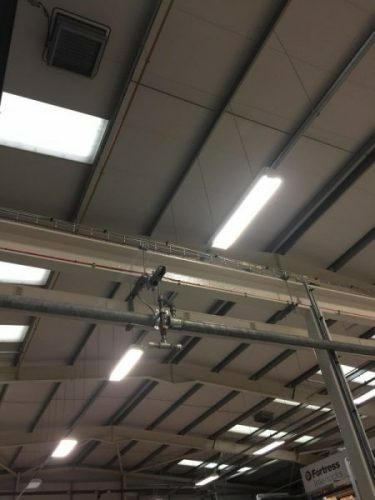 When a warehouse and distribution centre in Wolverhampton needed its lights changing. The business turned to commercial LED lighting installation experts at Excel Electrical. The decision was taken to upgrade to a series of LED lights so that the company would benefit in many ways. Within the warehouse and shop floor areas a new commercial LED Lighting installation scheme was implemented. This type of lighting improved the LUX levels with the light emitting diodes discharging a consistent and brighter level of illumination. Older lighting schemes can flicker and distribute light unevenly. The high bay solution brought in by Excel Electrical reduced light wastage by directing light consistently because of the reflectors and optics in the system. LED lighting is more efficient because no energy is wasted as heat. Being virtually maintenance free, the LED is also very robust and can last up to ten times longer than florescent bulbs. All of this adds up to improving the energy consumption of the business and reducing bills. Professional commercial LED lighting installation is ideal for warehouses, office lighting, retail, schools and colleges, industrial lighting and both indoor and outdoor situations. Do you require the services of a professionally accredited commercial electrical contractor in Stafford? Excel Electrical are an NICEIC approved electrical contractor with an impressive portfolio of projects in Stafford, Wolverhampton and across the UK. Highly experienced in commercial LED lighting installation, and all other aspects of electrical installations and testing for businesses. Contact us today for further information and to get a quote.